UNStudio architectural office completes the Theatre de Stoep Theater in Netherlands Archi-new - Free Dwg file Blocks Cad autocad architecture. Archi-new 3D Dwg - Free Dwg file Blocks Cad autocad architecture. Architectural office UNStudio finished his work on the Theatre de Stoep Theater-story 5800 square meters in the Dutch city Sbekeansé Spijkenisse, which was designed by architects to provide the city can celebrate Besalta altered to include plays, concerts, concerts and dance and musical performance. He has Architects in their determination to include all aspects of the theater of drama with the social aspects of the effectiveness of belonging to the local community through the creation of the lobby welcomed at four levels works Kpho entry and place of convergence of both. And explains the founder of the architecture office between the Berkeley Ben van Berkel that "contradistinction with the culture of today's globalized; offers participatory theater experience in the live event, which is often referred to Balambaharih - direct charm theater concept strange as energy between the audience and the performer." The lobby consists of several intersecting spaces include spaces cafeteria and restaurant as well as the entrances demobilized. And help to go bold colors within the building with an upper windows on the edge of the roof added natural light to the place. Architects also deliberately to focus on the lobby to serve as a special theater where visitors get together and go to a central place surrounded by views of the different levels in the building. Small theater can accommodate 200 spectators, while the largest can be 650 people have more than one third of them were sitting on the porch. To ensure the voice of diversity in the main theater Architects designed the ceiling consists of mobile elements can be reduced or deflected at an angle to fit with different degrees of sound high, these elements work in integration with parallel acoustic panels for the walls. Huge staircase leading to the entrances of laid-off, and has carved balustrade noticed the same on the surfaces of other furnishings in place handle. From the outside of the building features a curved Bactlth designed to prevent the inconvenience that may caused by natural wind in the region; and therefore was deflected from the building to pass near the surface without disturbing the direction of neighboring Nooitgedacht mill of the nineteenth century and which has become a landmark known locally. 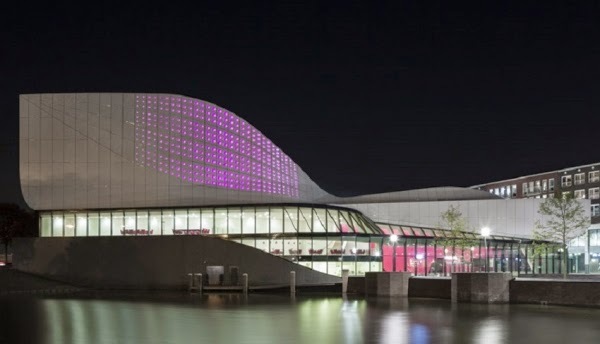 It also has to cover the upper parts of the walls of the building with two layers of aluminum so that the perforation of the upper-class ranks of the regular circular openings, which are lit from within Walid illuminate the color purple gives the distinct appearance of the building at night. Architectural studio in cooperation with the initial stages Arup Arup company to develop the curved shape of the building Almmmes without the complexity of the structural frame him; also been employed Building Information Modeling System (BIM) to be used for the maintenance and management of the building in the future.